This is a map of the Barony of Granard Warterford, Ireland. 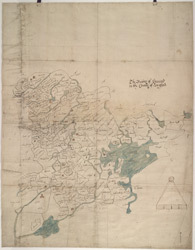 This is one of six maps of Ireland which were forwarded to Cotton in 1629 by Sir James Ware in connection with the Jacobean plantation of County Waterford. It dates from 1629, and is therefore contemporary with the English plantation scheme. This scheme aimed to establish an English colony in Ulster by confiscating land from the native Irish. The land was allocated to English and Scottish settlers and to Irish Protestants. However, the principal landlords had difficulty finding enough tenants and the financial viability of the plantation project was questioned. This problem was resolved as twelve London Companies were persuaded to invest in the land. The walled city of Londonderry and place names such as Draperstown are testimony to the English Companies involvement in the scheme. Longford lies outside the province of Ulster, the initial plantation area. The reason for this extension of the plantation was to find extra land so that Lord Chichester’s could reward his military allies and fellow captains from the Nine Years’ War with land and status in Ireland, in recognition of the service that they had done to the Crown. In order to accomplish this Wexford, Longford, Leitrim, West Meath, Upper Ossary, various territories which are all across the country, were confiscated and redistributed. This map shows the Barony subdivided into named plots.